benefiting our parks, open space and numerous City committees and projects. Tamra’s program, Resilient Neighborhoods, brings neighbors together to reduce household emissions, prepare for emergencies and build community. Together 283 households (105 in San Rafael) in Marin have reduced over 3 million carbon emissions (1 million in San Rafael). Bill’s work with Sustainable San Rafael has heightened the community’s awareness and proactive efforts to mitigate impacts of climate change. Tamra & Bill have been instrumental in the development and implementation of San Rafael’s Climate Action Plan and two Station Area Plans, various land use and zoning changes, and transportation projects, and both Tamra & Bill consistently step up and serve on civic committees, such as Bill’s service on San Rafael’s Advisory Committee for Economic Development and Affordable Housing advisory groups for electric vehicles, solar projects; and Tamra’s service on Marin County Fair planning committee. Tamra & Bill have organized numerous community events, such as the Lead on Climate events and actions, featuring state and local leaders, helping educate and draw awareness to climate change and the actions we, as the community, must take to ensure a healthy tomorrow. 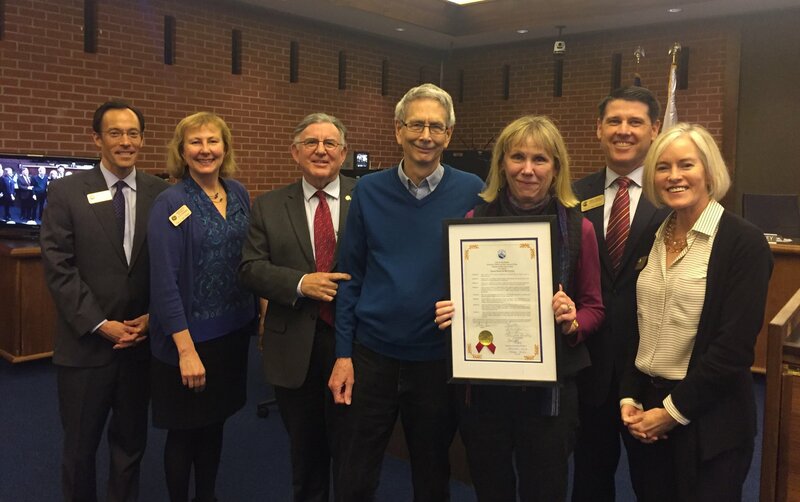 The City Council expresses its appreciation for Tamra Peters and Bill Carney’s efforts on behalf of our community and awards them the Richard P. O’Brien and the Mary Ferrario O’Brien Citizen of the Year Award.